Is your website ready for google’s upcoming mobile algorithm change , which will take effect April 21, 2015? The international launch will affect mobile searches in all languages worldwide and will significantly impact mobile organic search results. You can find out if your site is ready by testing it with the mobile-friendly testing tool below. It will give you a rough idea of how the “Googlebot” views your pages. The term being thrown around is “Mobilegeddon” as it’s the end of the world as we know it. That might be a tad dramatic, but the changes are real and the consequences could cost unprepared businesses thousands in lost revenue. The scoring system will not be on a scale, it’s either pass or fail. And the googlebot will not score your website overall, it will reward your site page-by-page. 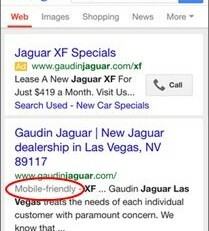 Google has published several documents that can assist you in making your site mobile-friendly. I would be happy to send you those guides. Just shoot me a quick email request to: Larry@MSAadvertising.com. And if you would like MSA Advertising to assist you on preparing your website for “Mobilegeddon”, I would be happy to assist.